Battlefield 3 is a FPS produced by Electronic Arts (EA) and pushes the Battlefield series further than ever before. The games focus is similar to previous instalments in the franchise with a focus on large scale multiplayer battles. 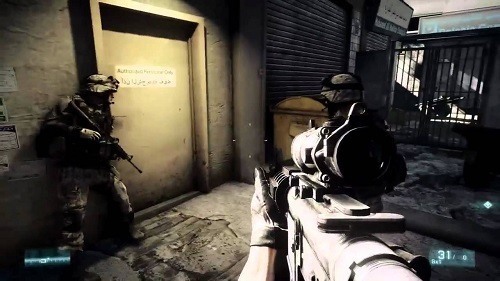 Battlefield 3 was released in late 2011 and met with great reviews from critics and fans of the series citing graphics and multiplayer features as the core reasons for high scores. In Battlefield 3 players will experience a vast single player campaign with options to tackle missions in a co-operative manner or take to the multiplayer game mode. 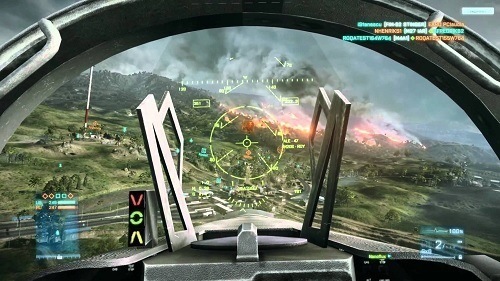 The PC version of Battlefield 3 supports battles for up to 64 players while the console versions offer slightly lower player caps and map restrictions to accommodate the change. Multiplayer features a wide variety of real world locations for players to battle over including New York, Paris, Kuwait and many others. As you would expect from a Battlefield game the maps include a great mixture of urban areas, metropolitan areas and open landscapes which encourage vehicle based battles. Just like other games in the Battlefield series the class system is a staple component of gameplay. In Multiplayer players choose from one of the four roles available in the game (Engineer, Recon, Support and Assault). Each of these class options has their own role to play and has different equipment to help them achieve that goal. Battlefield also offers multiple game modes, text chat, voice chat, statistics and the ability to easily join games with friends making it a great multiplayer experience. If you are looking for your next big FPS game that offers a well-rounded single player campaign and is packed full of multiplayer features then Battlefield 3 has everything that you are looking for. Great single player campaign with good variety. Focus on large multiplayer battles with vehicles included. Battle across some real world locations.